For those who really want to maximize their income, add a change machine next to your Well. That is what they did at a busy pediatric office waiting room in Lakewood NJ. When they first placed their Well, they heard from some stores in their area that people had been coming in to exchange bills for coins. 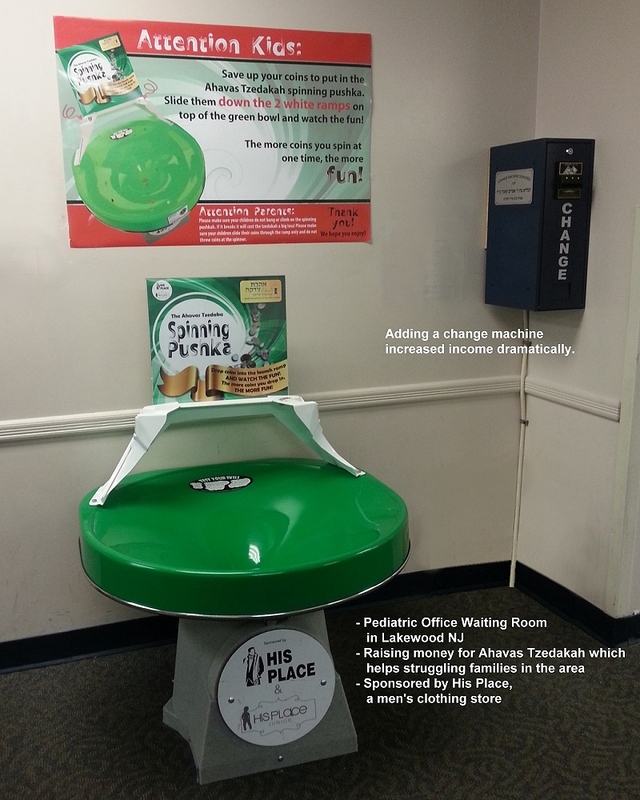 One of the stores liked the idea so much they donated a change machine which dramatically increased the revenue. Office Manager Nechama Schreiber reports, "It definitely keeps all the members of the family busy, and because the money is going to charity the parents are happy to give! We raise anywhere from $350 in a slow week to $1000 in a busy week! And that's in just one of our locations with a Well. I am always able to stock the change machine from the well without having to go to the bank." 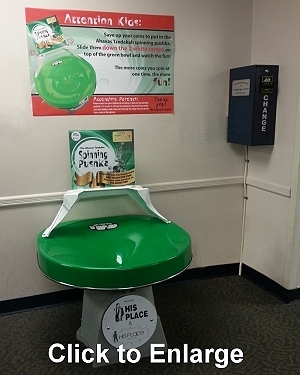 So if you have a good amount of foot traffic, consider mounting a change machine nearby. Dad's don't usually carry coins in their pockets, and when mothers have given their children all the coins from their purse, they will gladly slip some dollars into the change machine to give their children more opportunities to experience the Spiral Wishing Well. Change machines are available from many sources including Ebay for $300 to $400. Search "change machines". Note that this is a VERY busy waiting room, and we aren't suggesting that every pediatric waiting room will get this kind of revenue. Waiting rooms, especially where children are served, make great locations for Wells. Parents are happy to have their children distracted and like the idea that it is also helping charity. We want to thank Pediatric Affiliates in Lakewood for their report and enthusiasm. Their Wells support Ahavas Tzedakah a charitable organization dedicated to easing the burden of struggling families in Lakewood NJ and surrounding areas. The Well in the above picture is sponsored by "His Place" a men's clothing store in the area. Let us know how your Well is doing. We would love to publish a report like this for you.